Learn about the best essential oils for digestion. The knowledge and research regarding the use of essential oils for healthy living has exploded over the past decade. This has served to confirm what many natural health practitioners have known all along: Essential oils are a key piece of the puzzle when it comes to human wellness. There are countless ways to use a essential oils to enhance your health and daily life – from cleaning your house to aromatherapy. One way essential oils can naturally support your wellbeing is by maintaining the health of your gastrointestinal system. 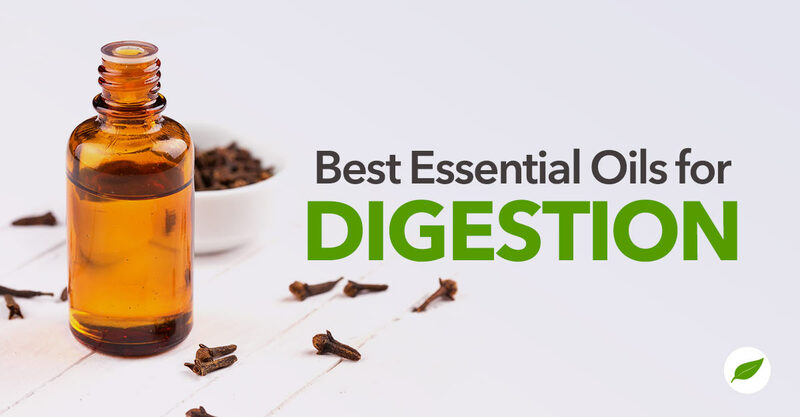 Read on to learn more about the best essential oils for digestion, and how to use them safely for yourself and your family. Recent scientific research shows that the gut plays a surprisingly large role in our overall health and functioning. Essential oils such as ginger essential oil, turmeric essential oil, thyme essential oil, and peppermint essential oil can be easily integrated into your diet or daily routine to balance and support healthy gut flora and digestion. Your gut, or your gastrointestinal system, is so much more than simply a way to process food and nutrients. Research shows that your gut is responsible for sending messages to and from the brain, like a switchboard. Believe it or not, your brain and your gut talk about more than just hunger and cravings; in fact your gut plays an important role in your mood, stress level, and focus. A healthy gut also supports a healthy internal response. When it comes to fighting off seasonal issues, maintaining a healthy gut can mean the difference between a day of productivity and a day of misery on the couch. “All foods we eat are in communication with immune receptors in the digestive tract, triggering hormones and various cell types that help the body with its immune function,” says Dr. Lisa Ganjhu, professor of medicine at NYU. Additionally, our guts are home to a unique and diverse microbiome, a collection of various types of bacteria, all of which can be responsible for maintaining balanced health and digestion. Stress, illness, an unbalanced diet and a strong course of antibiotics may be responsible for tipping the ratio of good and bad bacteria, leading to discomfort, illness, and irregular elimination. One way to support a balanced microbiome of healthy bacteria is by integrating key essential oils into your diet. In many Eastern countries, both turmeric and ginger essential oils have been used for centuries to support and maintain digestive health. Many also believe that peppermint essential oil is potentially beneficial to the health of your gastrointestinal system. Each of these essential oils contain unique compounds, all of which can play a role in supporting gut balance. Research is currently underway at Kansas State University regarding whether essential oils can be used to help livestock ward of diseases instead of antibiotics. The FDA has been urging farmers to reduce the amount of antibiotics give to livestock, and essential oils could play a key role in making this happen. This study concluded that lemon (limonene compound) and thyme (thymol compound) essential oils were the most effective in supporting livestock health. However, further research is needed. Turmeric has been used for years in traditional Asian medicine to support and maintain healthy digestion. A recent study showed that it both reduces the severity of gastric ulcers as well as oxidative stress in lab rats, leading researchers to conclude that turmeric essential oil may be of valuable assistance as one of the best essential oils for digestion. Turmeric essential oil should only be used internally with care, and if this is your plan, experts recommend only using the highest quality products. Peppermint essential oil is an incredibly versatile addition to your natural pantry that can also support your digestive health on a number of fronts. Peppermint essential oil can be used to potentially ease the discomfort and irregularity associated with certain gastrointestinal diagnosis. When you’re feeling nauseated, a bit of peppermint essential oil may bring some relief and has been tried with success at easing the digestive discomfort of cancer patients undergoing chemotherapy when added to a glass of water or dabbed behind the ear. Remember, peppermint essential oil is extremely concentrated and should be used and distilled with care. The same study that backed up the use of turmeric essential oil for digestive health also showed the effectiveness of ginger essential oil for reducing ulcers and oxidative stress. The flavor and aroma of ginger has long been associated with stomach comfort and wellness. Considered one of the most “gut-friendly” essential oils, ginger essential oil may help relieve the symptoms of colic, ease nausea discomfort and could reduce inflammation in the gut, restoring balance. Lemon, grapefruit and orange essential oils bring a fresh brightness to the table which may also be helpful in supporting digestive health. Studies show that when diffused, lemon oil may successfully ease the symptoms of nausea that often accompany the early months of pregnancy. When taken slowly in a glass of cool water, lemon essential oil may calm the stomach after a bout of vomiting. Thyme essential oil is an extremely powerful antioxidant which may provide a widespread benefit to many of your body’s systems and functions. Because of its antioxidant-rich chemical makeup, using thyme essential oil may benefit your body by helping you flush out toxins through urine and waste, allowing your system to rebalance and regain stasis. Thyme essential oil can be taken internally or applied topically for potential digestive support and relief. Another essential oil that has proven to be effective for supporting digestive health is coriander oil. Coriander is a natural analgesic and antispasmodic, suggesting it may help balance the gut as it reduces unhelpful bacteria. Although coriander essential oils can be taken internally, it’s best to try it topically first and check with your healthcare provider before ingestion. If you decide to take it internally, it’s best when mixed into warm water with a bit of lemon and honey for flavoring. Each essential oil is different and should be integrated into your life differently depending on the makeup of the product as well as your own unique health needs. It’s always best to check with your doctor or healthcare provider before taking a new essential oil internally, as it may not be beneficial for your unique health needs. Research the best ways to use each of the best essential oils for digestion to see which application is most likely to provide the relief you’re looking for. It’s always wise to do your research before using essential oils with children, as not all are considered safe for kids. Coriander essential oil may provide a calming effect for your children in the midst of stomach troubles; try rubbing it on their back in a soothing manner blended in a low ratio with a trusted carrier oil. Additionally, diffusing lemon or peppermint oil in the midst of a stomach bug is fine, but be careful not to use peppermint oil around children under the age of 6. Ginger essential is widely considered to be safe for use on children and can be taken internally or diffused to ease tummy troubles. Citrus oils are also generally safe for use with children and may also be helpful in calming sick or overstimulated kids. Citrus essential oils will also help kill germs when mixed into a natural sanitizer, which is generally needed when dealing with sick or nauseated little ones. Which essential oils for digestion will you try? Share your thoughts in our comments section!